I have been craving french toast for so long! It was my husband’s and my all time favourite breakfast. Over the last few years he still has it sometimes and I try not to weep longing for my old foods! 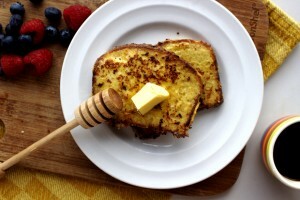 When I developed a grain-free sandwich loaf that I was happy with, french toast was next on the list! Luckily, I was right. My sandwich loaf recipe is definitely robust enough to be fried and it is so delicious. My husband even eats this version now. Trust me, that says A LOT! There is just something about having a break from the norm at the weekends that I love. 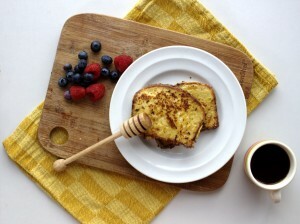 I love that as a family we have the time for a leisurely breakfast as a stark contrast to the rushed midweek ones! Breakfast is definitely one of our favourite meals and most of the time we go all out. 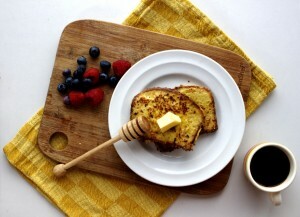 You’ll find the SCD sandwich loaf recipe you need to make this french toast here. 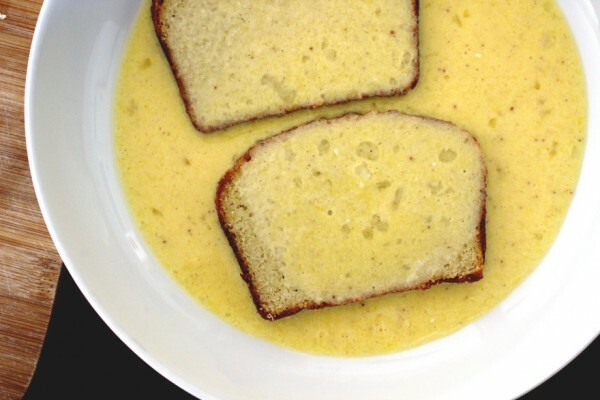 The secret to a great french toast is in the soaking. Resist the temptation to skip the soaking step. It is really important to allow it to soak up as much of the egg mixture as possible. I usually let it soak while I’m preparing my delicious toppings! Fresh fruit, homemade yoghurt, eggs, bacon and now delicious french toast all surrounded by my two favourite people in the world. What more could a girl want? I remember when I started SCD first I was actually most worried about breakfast. No grains? Limited dairy? What’s left, I remember thinking. Little did I know that a short two years later I would have a long list of delicious breakfast recipes to choose from. I guess you could say that the limits of SCD have actually spurred me on to come up more and more tasty dishes. My husband would agree that I love a good challenge! What I once viewed as a diet that would ruin my life has actually enriched my life not to mention improved my health beyond belief! Back to this french toast – we love it. I hope you do too!